Spectacular scenery is combined with fascinating culture and history, in our 10-day tour-trek to popular Mount Damavand and the major sights of Isfahan and Shiraz. The highest peak of the Alborz range is an extinct volcano, its peak covered in snow for most of the year, with small mountainside villages where people still lead a simple way of life largely unchanged for centuries. 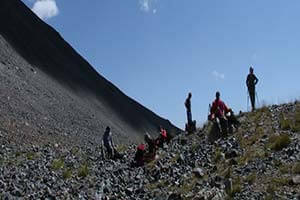 It is possible to climb Mount Damavand from all sides, and we choose the easiest Southern approach, which takes 3 days. The glories of Isfahan and Shiraz and their historical monuments add a magnificent extra dimension to make this tour a truly exceptional travel experience. Arrive early morning in Tehran and transfer to your hotel. The morning is spent visiting Archaeological, the Reza Abbasi museums and Sa’ad Abad Palaces. We then drive to the popular summer resort of Darband, for lunch, then onward to the pretty village of Raineh. We overnight at the Raineh Club or in a local house. An early morning drive to Gosfand Sara (2 hrs) takes us to the starting point of our trek. From here it will take us approximately 7 hours to trek up to a height of 4200m, to the point called Bargah-e-Sevom. We overnight in a mountain hut or tent. A 4am start begins the final stage, climbing to the summit of Damavand at a height of 5671m. We descend to the shelter in Bargah-e-Sevom. 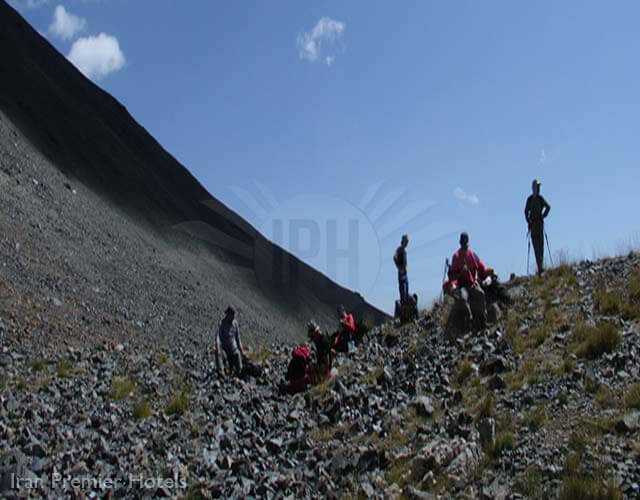 to overnight in a mountain hut or tent after a total of 12 hours trekking. We descend to the village of Raineh and drive back to Tehran. After our flight to Shiraz, a full day sightseeing includes Eram Garden, the Shah Cheragh shrine, Hafez and Saadi Tombs, and the lively Bazaar. Our overnight stay in Shiraz. We enjoy an excursion to Persepolis, Naghsh-e-Rajab and Naghsh-e-Rostam, followed by another night in Shiraz. We drive to historic city of Isfahan, visiting Pasargade on the way. Overnight stay in Isfahan. A full day sightseeing, visiting Imam and Sheikh Lotfollah Mosques, the Aliqapou Palace, Vanak Church, the Shaking Minarets, and the Fire Temple. Our overnight stay is in Isfahan. Sightseeing in this fascinating city continues with the Friday Mosque, Chehel Sotoun, Hasht Behesht Palace and Khajou Bridge. We then fly to Tehran for an overnight stay. Transfer to Tehran Airport for your flight to London.